In another bowl, mix together 3 tablespoons of Coco Treasure Organics Extra Virgin Coconut Oil, 1 cup of Coconut milk and an egg. Add both of the mix together and stir until both of the mixtures are combined. Prepare the waffle iron and heat it up, Grease up the iron to prevent the waffle mix from sticking. Cooking time. This will totally depend on the manufacturer’s instructions of your waffle iron. Drizzle with Coco Treasure Organics Coconut Nectar Syrup and top with whipped cream. Enjoy! Waffles are everywhere. We see them at food stands, supermarkets and shopping malls. It is consumed by almost every region in the world with their own version. Popular to many, Belgian wafflesare more exposed to marketing schemes due to their distinct taste and heritage when it comes to the leavened batter or dough dish. The history of the humble waffle date back to the medieval century when the Dutch and the French consumed the dish with a variety of recipes. The Belgian waffle came into the limelight when the rest of the world had tried the tasty treat when trade and commerce allowed it to cross borders. There is also a running debate on the similarities between the pancake and the waffle but both are great breakfast food whichever you choose. A lot of varieties have been invented as people search for more exciting ways to give a little twist to what is basically a dish that has been consumed for centuries. We have one offering just for you! 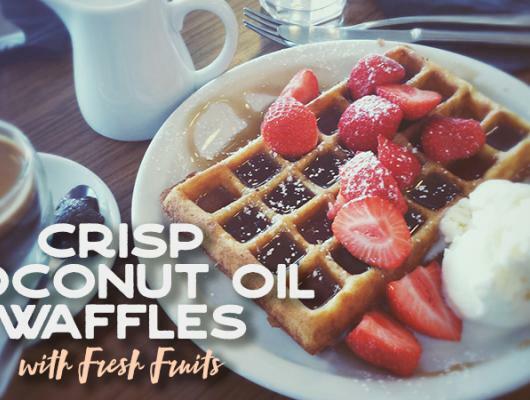 Presenting, our very own Crisp Coconut oil Waffles with Fresh Fruits. This another twist from yours truly, offering you nutritional value to your already tasty treat. Here are the ways you can prepare the sumptuous dish all made in few easy well guided steps. 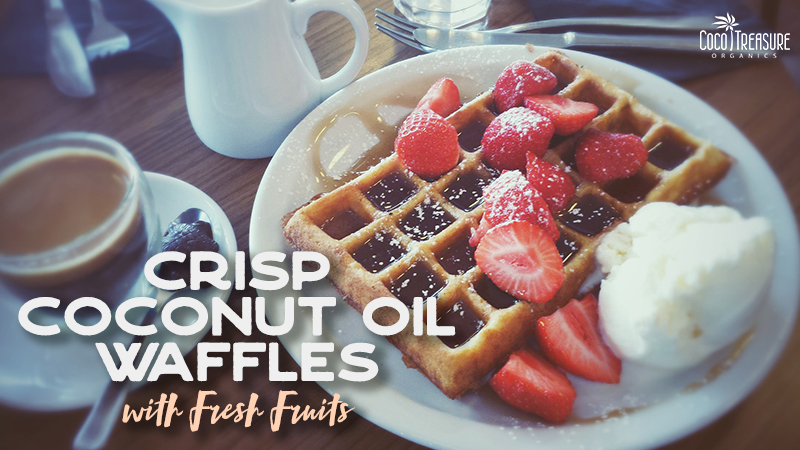 Now, you can now enjoy our sumptuous easy to make Crisp Coconut Oil Waffles with fresh fruits. Enjoy with friends or serve as a healthy breakfast meal to start the day along with our Coconut Banana Smoothie. There is always a way to add in nutrients to your daily munch. The humble coconut serves its purpose in so many ways that it defies description onto how much this miracle of nature exists in our daily lives. Until our next cooking escapade, see you. Stay healthy, stay organic with Coco Treasure Organics!